Folks, the recent thread about the CHP lane splitting guidelines announcement got me thinking. There was some mention in the thread that PSAs might be in order, and I thought it'd be great if there was a website that we could send car drivers to so they could get more info. I also thought it'd be great if the URL for the site was simple and conveyed the message on its own, so that folks who didn't get to the site might still get the message. So I made LaneSplittingIsLegal.com. My original idea was to just have a splash page with some links, but I wanted to have stickers that people could slap on their bikes. Then I thought that ongoing news would be good, as well as other resources. So there's a bit more to it now. The site is still something of a work in progress but the bulk of the idea is there. There's a link to order stickers from CafePress. I also plan to do a big run of stickers and drop li'l stacks of them at local bike shops and maybe events. I'll probably also make the road sign graphic available in large form to anyone who wants to use it. 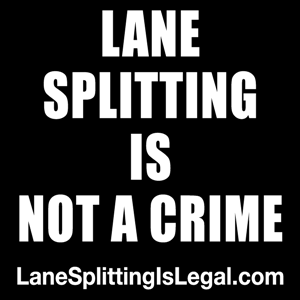 Anyway... check it out at LaneSplittingIsLegal.com let me know what you think, and tell your friends. There's a Facebook page now, too. Since there seems to be some confusion about stickers, I'm adding that info here. There are currently three designs available here. I'm working on getting a run of 1,000 or so done - as soon as I get those, I'll do some kind of free sticker in exchange for a donation to BARF deal. There are more designs/sizes coming soon - specific sizes for your cage, etc. If you want a specific color or size, please let me know and I'll see what I can do. Here are two of the stickers that are currently available. Click 'em to get 'em. Last edited by Surj; 01-30-2013 at 04:55 PM..
Good stuff! I like it! Shouldn't you have made it "LaneSharingIsLegal.com"? Or was that taken already? In any case, good work trying to get the word out! I would recommend modifying the sign to give the rider a little more room. Two inches on either side is just a bit close. 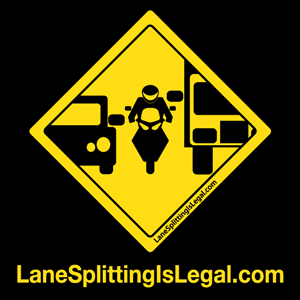 The CHP's Lane Splitting General Guidelines use the term "lane splitting" and also mention "lane sharing" and filtering. Since my goal with the site is primarily to promote those guidelines (thus that text being the focus of the home page) and the idea that whatever it's called, it's legal, I stuck with their language. I know that some folks care a lot about the slight (or merely semantic) differences between splitting and sharing, but I don't think it really matters in this context, and it's best to just match the language being used in the official guidelines from The Man. Last edited by Surj; 01-29-2013 at 06:44 AM..
That's to scale for the Bay Bridge, sir. But you make a valid point. nice site. i just went there. and lanesplitting saves time for everyone by getting some vehicles off the road sooner, diminishing congestion so the cagers have a more pleasant commute. Awesome. Spread the word. how can we make it go viral? As for spreading the word - just tell your friends. I'm going to put a few more touches on the site and start promoting it a bit more. I'm also going to get a bunch of stickers made up and distribute them to shops and other riders. My original idea was that guys like me would be splitting every day with these stickers on their saddlebags/topcases/helmets/whatever and folks would either "get it" or go check out the site. Thus the no-nonsense URL. At least, I think it's a no-nonsense URL. Great idea, and thank you for putting it together! I don't know what it costs to register an additional web address, but if "lanesharingislegal.com" is available I am more than willing to help underwrite its purchase. Put in an automatic redirect and not only would you get both constituencies, you would underscore that, semantics aside, both terms are valid (and legal). And please keep us posted as the when the stickers are available, I want one for my truck. Just one suggestion: The PSA acronym may not be widely understood. Googling for it ranks "Prostate-Specific Antigen" and "Professional Sports Authenticator" at the top. Radical, shared on facebook to promote. Thanks! "no warranties on content herein accurate or complete; not responsible for error, omission or result"